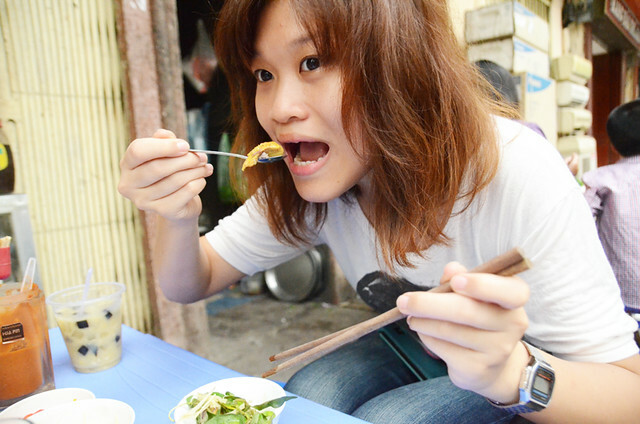 Eating Hot Vit Lon (Vietnamese Fetal Duck Egg) in Hanoi. 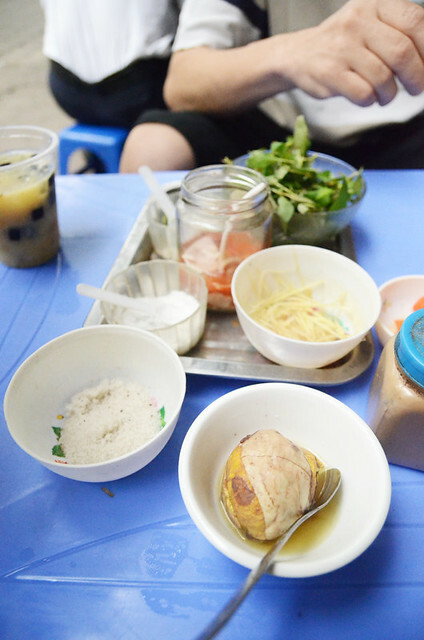 When I was in Hanoi earlier this year, there were 3 things that I was determined to eat; Bahn My (Vietnamese sandwich), Bahn My Pate Thit (Vietnamese sandwich with pate) and Hot Vit Lon (Vietnamese fetal duck eggs). I am glad to say I managed to eat all 3 of them and more. The most interesting experience was of course eating the barely formed duck still encased in its egg. 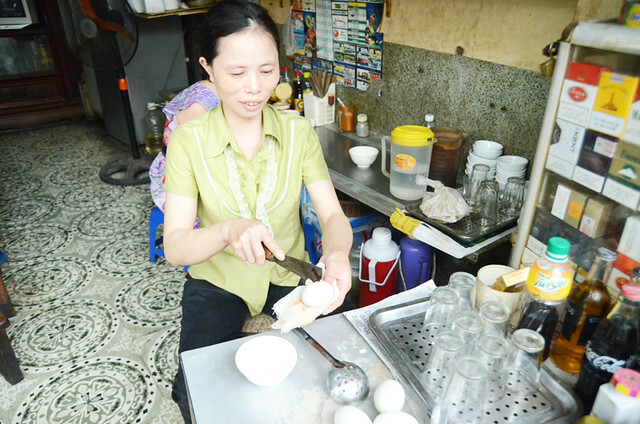 The eggs are quite easy to find on the streets of Hanoi, especially where food is common. I spotted the stall I bought my egg from not long after walking down a road near my hotel. 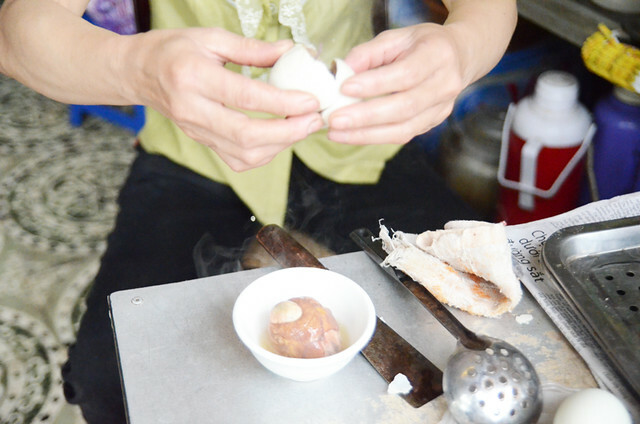 After I ate my egg and continued walking, I spotted many more stalls selling Hot Vit Lon. # – Lady boss cracking the egg. # – Dropped it into a bowl. # – Then served it to me along with fresh herbs and seasonings. # – The partially formed baby duck. # – Then I ate it. The best way to describe the taste…it was like eating a large egg-yolk with bits of marrow and bits of gelatinous parts. 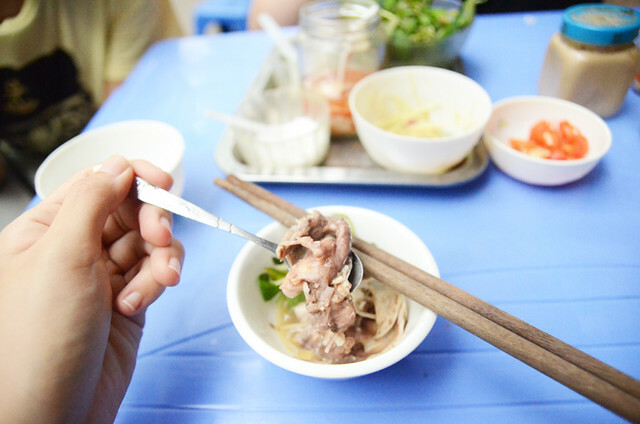 The partially formed beaks, bones and hair were very mildly crunchy, kind of like eating really soft cartilage. It was quite tasty really with seasonings and fresh herbs. Like eating an enhanced egg. I would eat it again. In fact, they should do the same thing to chicken eggs here to be honest.